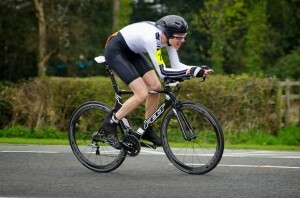 Two members competed in the Withington Wheelers 25 mile time trial on the J2/9 course. The conditions were unsettled with a moderate southerly wind. Member’s times were Ben Norbury 57:27 and Kelvin Milward 1:01:39. The event was won by Adam Duggleby with a time of 52:05. 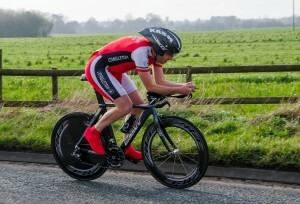 Six club members were on the start sheet for the final of series of three 10 mile TT promoted by the Manchester and District TT Association on March 29th. Ben Norbury in his opening race of 2014 recorded an excellent 23 minutes and 15 seconds for 10th place overall in windy conditions. Other times were Peter Smith 24:28, Kelvin Milward 24:55, Duncan Poole 28:00, Edgar Reynolds 29:40. Mark Allen (juvenile) was a non starter because of injury, although he did win a team award in the first of the series. Together with Joe Langford and Peter Smith, he won the best team consisting of a Juvenile, junior and veteran. Pete was also third best veteran and Wayne Powell won the spot prize for 30th position, making it a good day for the club. The clubs Tuesday evening TT program got underway on April 8th with a 9.5 mile hilly circuit of the cloud. Results will be published in the next Chronicle report. Next week the event is on the Congleton-Holmes Chapel-Brereton circuit. There were 15 club members out for the hilly reliability on 30th March, but sadly no visitors this time. The route went up Park lane, around the cloud through Bosley and Macclesfield forest before entering the peak district and then returning to Congleton. This year parts of the route were shared with the Cheshire Cat sportive which crossed on a number of occasions. It was a cold and drizzly day and riders were met by some short downpours of hail followed by a few spells of sunshine. Unfortunately one member had a mechanical problem and could not finish but everyone else got back with no problems. A few members entered the Cheshire Cat sportive, completing a mixture of medium (75 miles) and long (100 miles) routes. On Sunday 30th March, a group of 5 riders took part in the ride to Dagfields Craft Centre at Hatherton. As the crow flies this is not so far but by riding a circuitous route the ride distance was about 55 miles, going out via Church Minshull and Nantwich, returning via Betley, Audley and Alsager. Priest Hole cafe. Coming home was easier. The wind was now behind for the return through Wybunbury, Weston, Barthomley and Hassall Green. John Broadbent completed the Ashbourne duathlon on Sunday 6th April, which involved a 5K run, 30k hilly bike ride (470 metre elevation gain) and another 5k run. John finished in 1hr 59 mins and 37 secs and was 2nd in his age group (he asked that we do not enquire how many were in his age group!). Tonight (10th April) is the club quiz, at the Rugby club. The bar will be open and there will be a break for toasties (included in the entrance fee of £2:00 per person). Starting at 8:00p.m. it is sure to be a great social event. New members especially welcome, so come and meet some of your club mates. The six sessions on bike maintenance concluded on March 27th. with Wayne Powell demonstrating how to change the bottom bracket bearings and fit a new chain set. This was very well attended and members are asking for the program to be repeated (next winter). Upcoming social events on Thursday evenings in the Rugby Club include a slide show by Rob Waghorn on April 17th about his 2013 ride from Alaska to Mexico, starting at 8 p.m. This Sunday sees the clubs first Audax promotion of 2014 also organised by Rob. Two rides are on offer, a 207 km route to Ironbridge and back and a 133 km route to Hawkstone. Pre entry is necessary and entries are now closed, but the next of Rob’s Audax promotions is on June 1st with 200 and 100 km routes on offer.